The ninth season of The Walking Dead, an American post-apocalyptic horror television series on AMC premiered on October 7, 2018, and will consist of 16 episodes, split into two parts, each consisting of eight episodes. The second part of the season premiered on February 10, 2019. Developed for television by Frank Darabont, the series is based on the eponymous series of comic books by Robert Kirkman, Tony Moore, and Charlie Adlard. The executive producers are Kirkman, David Alpert, Scott M. Gimple, Angela Kang, Greg Nicotero, Tom Luse, Denise Huth, and Gale Anne Hurd, with Kang taking over the role of showrunner from Gimple. The ninth season is the final season for lead actor Andrew Lincoln, who has portrayed Rick Grimes since the series' first season. Lauren Cohan, who portrayed Maggie Greene since the second season, only appeared in the first five episodes of this season due to other commitments. The ninth season features nineteen series regulars overall. For this season, Katelyn Nacon and Tom Payne were added to the opening credits, along with Khary Payton as of the season's sixth episode, after previously being credited as "also starring". Callan McAuliffe and Avi Nash were promoted to series regular status, after previously having recurring roles. Samantha Morton joins as a series regular and is added to the opening credits beginning with episode ten. 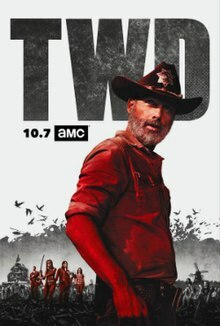 This will be the first season not to include Chandler Riggs, Austin Amelio, Steven Ogg (since their first appearance on the series), and the first not to include Lennie James since he was promoted to a series regular in the sixth season (James did not make any appearance on the series second and fourth seasons), all were credited as either a series regular, guest or a main cast member in previous seasons. Andrew Lincoln as Rick Grimes, the protagonist of the series. Rick is a former sheriff's deputy from King County, Georgia, and the former leader of the rebuilt Alexandria. He is coping with the recent death of his son Carl, while raising his daughter Judith with his romantic partner Michonne. Norman Reedus as Daryl Dixon, a southern redneck and Rick's right-hand man. Daryl is a skilled hunter and a former recruiter for Alexandria. He was running the Sanctuary since the downfall of Negan, but later quit the occupation. Lauren Cohan as Maggie Greene, Glenn's widow, a mother figure to Enid and the former leader of the Hilltop. She is mother to her and Glenn's child, Hershel. She is at odds with Rick over sparing the life of Negan, the former leader of the Saviors. Danai Gurira as Michonne, a katana-wielding warrior and Rick's romantic partner. She is also a mother figure to Judith and mother to her and Rick's child. Melissa McBride as Carol Peletier, a survivor who has overcome several traumas, is a skilled and ingenious fighter, and now resides at the Kingdom with her husband Ezekiel. Alanna Masterson as Tara Chambler, a supply runner of Alexandria who served as a liaison to Oceanside and is now at peace with the former Saviors. Josh McDermitt as Eugene Porter, a cowardly but intelligent survivor who was instrumental in defeating the Saviors and won back the group's trust. He also secretly has feelings for Rosita. Christian Serratos as Rosita Espinosa, a pragmatic member of the group who was the former partner of the now-deceased Abraham. Seth Gilliam as Gabriel Stokes, a priest who has reconciled his beliefs with what needs to be done to survive. Ross Marquand as Aaron, a recruiter from Alexandria who lost his boyfriend Eric during the war, and now raises his adoptive daughter, Gracie. Katelyn Nacon as Enid, a survivor of the Hilltop and a daughter figure to Maggie who was learning medicine from Siddiq. Tom Payne as Paul "Jesus" Rovia, a Hilltop recruiter and Maggie's right-hand man who serves as her voice of reason. Jeffrey Dean Morgan as Negan, the former leader of the Saviors and previous antagonist, who is incarcerated following his defeat in the previous season. Khary Payton as Ezekiel, the charismatic leader of the Kingdom who helped Rick defeat Negan and his Saviors. He is married to Carol. Samantha Morton as Alpha, the leader of the Whisperers, a mysterious group of survivors who wear the skins of walkers to mask their presence and the main antagonist of the second half of the season. Xander Berkeley as Gregory, the arrogant, selfish, and treacherous former leader of the Hilltop who is adjusting under Maggie's leadership. Pollyanna McIntosh as Anne, the former leader of the Scavengers (previously known as "Jadis") who has since integrated into Alexandria. Callan McAuliffe as Alden, a former member of the Saviors who had defected to Maggie's group during the war against Negan. Avi Nash as Siddiq, a former vagabond and doctor who was rescued by Carl before his death. Kenric Green as Scott, a supply runner in Alexandria. Mandi Christine Kerr as Barbara, a resident of Alexandria. Tamara Austin as Nora, a resident of Alexandria and Michonne's friend. Jennifer Riker as Mrs. Robinson, a resident and gardener of Alexandria. Lindsley Register as Laura, a former lieutenant of the Saviors and former gardener of the Sanctuary. She defected to Alexandria after the events of the bridge rebuilding. Matt Mangum as D.J., a former hostile lieutenant of the Saviors and former guardian of the Sanctuary. He also defected to Alexandria after the events of the bridge rebuilding. Chloe Garcia-Frizzi and Cailey Fleming as Judith Grimes, the daughter of Lori Grimes and Shane Walsh and adopted daughter of Rick and Michonne. Anabelle Holloway as Gracie, the daughter of a Savior who was killed by Rick during a fight; she is adopted by Aaron. Brett Butler as Tammy Rose Sutton, a resident of the Hilltop and wife to Earl. John Finn as Earl Sutton, the Hilltop's blacksmith and husband to Tammy. AJ Achinger as Kenneth "Ken" Sutton, a resident of the Hilltop, son of Earl and Tammy. Karen Ceesay as Bertie, a resident of the Hilltop. James Chen as Kal, a protector and guardian of the Hilltop. Peter Zimmerman as Eduardo, a resident of the Hilltop. Anthony Lopez as Oscar, a resident of the Hilltop. Gustavo Gomez as Marco, a supply runner of the Hilltop. Kelley Mack as Adeline, a resident of the Hilltop. Jackson Pace as Gage, a resident of the Hilltop. Traci Dinwiddie as Regina, a former lieutenant of the Saviors, and member of a group of rebel Saviors. Elizabeth Ludlow as Arat, a former lieutenant of the Saviors who has made peace with Rick's group. Chloe Aktas as Tanya, a resident of the Sanctuary and one of Negan's former "wives". Elyse Dufour as Frankie, one of Negan's former "wives". Zach McGowan as Justin, a hostile Savior not interested in working together with the other communities and loyal to the order of Negan's leadership much to the disgust of Daryl. Rhys Coiro as Jed, a rebellious member of the Saviors who also wants to go back to Negan's ideology. Cooper Andrews as Jerry, a resident of the Kingdom and Ezekiel's right-hand man who is in a relationship with Nabila. Kerry Cahill as Dianne, one of Ezekiel's top soldiers and a skilled archer. Matt Lintz as Henry, a resident of the Kingdom and the younger brother of the deceased Benjamin. He is also adopted son of Carol and Ezekiel. Nadine Marissa as Nabila, a resident and gardener of the Kingdom and Jerry's girlfriend. Sydney Park as Cyndie, a young woman who has become the leader of the Oceanside community following the death of her grandmother, Natania. Briana Venskus as Beatrice, one of Oceanside's top soldiers and Cyndie's right-hand, who resents the Saviors. Nicole Barré as Kathy, one of Oceanside's top soldiers. Mimi Kirkland as Rachel, an aggressive young member of Oceanside. Nadia Hilker as Magna, the feisty leader of a small group of roaming survivors. Eleanor Matsuura as Yumiko, Magna's girlfriend. Dan Fogler as Luke, a former music teacher who has come to appreciate safety in numbers. Lauren Ridloff as Connie, a deaf member of Magna's group. Angel Theory as Kelly, Connie's protective sister and a member of Magna's group. Cassady McClincy as Lydia, Alpha's daughter and Henry's love interest. Ryan Hurst as Beta, the second-in-command of the Whisperers. Jon Bernthal as Shane Walsh, Rick's best friend and fellow police officer, who was previously killed by Rick in the second season, appears in one of Rick's hallucinations. Sonequa Martin-Green as Sasha Williams, a former survivor of Rick's group, who sacrificed herself to help Rick and his survivors against Negan during the seventh season, appears in one of Rick's hallucinations. Scott Wilson as Hershel Greene, Maggie's father, who was previously killed by The Governor in the fourth season, appears in one of Rick's hallucinations. Eighteen months after Negan's defeat, the various communities are working on rebuilding society, however, the Sanctuary suffers from infertile ground and underlying support for Negan. Rick leads a trek to a Washington, D.C. museum to recover pioneering supplies; on the way back, they find the main bridge to Hilltop has been wiped out by a storm, forcing them to detour. A young man, Ken, is killed while protecting the group's horses from walkers. Gregory, ousted as Hilltop's leader, convinces Ken's father, Earl, to try to assassinate Maggie, but he fails. Rick and Michonne ask Maggie for Hilltop's help in providing for the Sanctuary, but she refuses. That evening, Maggie has Gregory publicly executed for his actions. A month after Gregory's death, the communities work together to repair the bridge; several Saviors have gone missing since construction began. After some persuasion, Maggie ultimately decides to deliver food to a starving Sanctuary. A herd approaches the repair crew after Justin fails to sound an alarm, and Aaron's arm is crushed under a log. Daryl rescues Aaron, and Enid is forced to amputate Aaron's arm to keep him alive. Anne and Gabriel pursue a romantic relationship, but Anne takes note of a nearby helicopter. Rick updates an incarcerated Negan on the bridge's progress, and Negan warns him that his vision will fail. Justin is banished, and on his way back to the Sanctuary, he is abducted. After Justin is discovered dead, Arat goes missing as well, angering the Saviors and postponing the construction on the bridge. Rick asks Gabriel to follow Anne, who is revealed to have been trading people to a mysterious ally in exchange for supplies; Gabriel confronts her, forcing her to incapacitate him. Daryl and Maggie learn that Oceanside has been capturing and killing the Saviors, including Arat, as revenge for killing Oceanside's men; they walk away as Cyndie kills Arat, and they decide to ignore "Rick's way" and confront Negan. Jesus tells Rick about Maggie's intentions to assassinate Negan, and Rick tries to delay her entry into Alexandria. Anne plans to send Gabriel away to her mysterious ally, but changes her mind and abandons him instead. The Saviors steal guns and confront Carol over Oceanside's actions; a riot ensues and the gunfire leads a walker herd to the work camp. Rick takes a horse to lead the herd away from the camp, but the horse is spooked and throws him off onto a concrete slab, impaling his torso with rebar and knocking him unconscious. Critically wounded and weak, Rick attempts to draw the herd away on horseback. Maggie goes to execute Negan, but after realizing that he is worse than dead already, she abandons the attempt. Rick leads the walkers onto the bridge and apparently sacrifices himself by blowing it up, stopping the herd. Unknown to everyone else, Rick is found alive and rescued by Anne, who contacts her allies in the helicopter and they gather the duo, flying to parts unknown. Six years later, a now pre-teen Judith rescues a new group of survivors from walkers. After much resistance, Judith convinces Michonne to help Magna's group by escorting them to Hilltop. While setting up radio transmitting equipment, Rosita and Eugene are followed by a strangely-acting herd of walkers. Carol takes a now teenage Henry to Hilltop to apprentice as a blacksmith; they are ambushed by Jed, Regina and several former Saviors who steal their supplies. Carol later burns the group alive and takes Henry to visit Daryl, who is now living alone in the wilderness. Negan remains a prisoner in Alexandria but has apparently taken on a less antagonistic attitude. Michonne leads Magna's group towards the Hilltop but refuses to travel all the way, fearing a confrontation with Maggie; she learns from Siddiq that Maggie recently left the Hilltop in order to help Georgie build another community, leaving Jesus and Tara in charge. Michonne brings Magna's group to their former camp, allowing Luke to recover some of the musical instruments he had been scavenging. While Jesus and Aaron are discussing how to bring Hilltop and Alexandria closer together, they see a flare shot by an injured Rosita, who informs them of Eugene's whereabouts. After escorting Carol and Henry to Hilltop in order for Henry to apprentice as a blacksmith, Daryl takes Jesus and Aaron along with him to search for Eugene. After Gabriel accidentally leaves his cell unlocked, Negan escapes from confinement. Henry begins his apprenticeship with Earl, but sneaks outside Hilltop and gets drunk, leading to him being temporarily imprisoned. Magna's group is ultimately accepted into Hilltop, but are told by Tara that they must "earn their keep". Daryl, Jesus and Aaron find Eugene, who reveals that he heard walkers whispering to each other, suggesting that they are evolving. The whispering herd pursues the group and corners them in a cemetery. Michonne, Magna, and Yumiko arrive to help, but Jesus is killed after a "walker" stabs him through the chest. After fending off the herd, the group discovers that the whispering walkers are indeed people wearing walker skins; the Whisperers suddenly surround the group. Michonne's group manages to escape the cemetery; they capture a young Whisperer, Lydia, on their way back to Hilltop. Michonne and Daryl attempt to get answers from the girl without much luck, though she admits that her mother is still alive and that her people live among the walkers. Rosita tells Siddiq that she is pregnant with his baby. Tara agrees to let Magna's group stay at Hilltop while Michonne plans to return to Alexandria to warn her people of the new threat. After escaping Alexandria, Negan returns to the Sanctuary only to find it abandoned, thus returning to the comfort of his cell in Alexandria willingly. Luke and Alden are lured into a trap and captured by the Whisperers. As Henry and Lydia grow closer, she reveals events of her past following the onset of the outbreak. Henry is released from his cell by Daryl when he feels that the boy is revealing too much to Lydia. After aggressively interrogating her, Daryl takes a softer approach with Lydia after realizing she is the victim of abuse at the hands of her mother. Despite the risks, Magna's group searches for Luke against Tara's orders; they abandon the search after realizing it's no longer safe. The next day, a group of Whisperers arrives at the Hilltop led by Lydia's mother, Alpha, who demands her daughter be returned. In a flashback, Tara and Jesus give Ezekiel the community charter. In the present, Alpha successfully negotiates with Daryl for an exchange of hostages–Alden and Luke for Lydia; Daryl watches with indignation at how Alpha treats her daughter. Ezekiel, Carol, Jerry, and other Kingdommers enter a movie theater in order to obtain a film projector bulb for a cinema they want to set up for the community fair. Later, Henry leaves the Hilltop, suggesting he is going out to look for Lydia; Daryl sets off with Connie in pursuit. The series was renewed for a ninth season in January 2018. 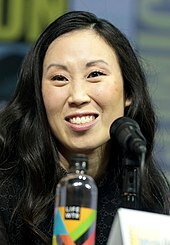 Along with the renewal, it was announced that showrunner Scott M. Gimple would be promoted to chief content officer for both The Walking Dead and its spin-off show Fear the Walking Dead, while writer and co-executive producer Angela Kang would take Gimple's role for The Walking Dead. Filming for the ninth season began on April 30, 2018, with Greg Nicotero directing the first episode of the season. Michael Cudlitz, who played Abraham Ford, directed the seventh episode of the season. The ninth season features a redesigned opening credits sequence. The animated title sequence, which is graphic novel inspired, features familiar imagery such as Daryl's motorcycle and crossbow, and Michonne's katana. Kang spoke of the inspiration for the new sequence, "The feel of the season has elements of the Western genre. We're paying homage to some of the iconic moments from the graphic novel. Life is coming out of death. Nature's taking over, while other things are crumbling." The ninth season is the final season of series lead Andrew Lincoln. Most of the cast's contracts had to be renewed for the ninth season and beyond, and most of the cast did re-sign; the notable exception was Lauren Cohan who plays Maggie Greene. Cohan had sought a pay increase from AMC given her high demand from other networks; while she had signed on to star in a new series, Whiskey Cavalier, for the ABC network, this contract would still enable her to participate on The Walking Dead in a limited role. In April, Cohan confirmed she signed on for the ninth season but only for six episodes. At the end of the eighth season, former regular Lennie James (as Morgan Jones) was moved to The Walking Dead's companion series, Fear the Walking Dead, as showrunner Scott M. Gimple felt there were more stories about Morgan to tell that would be more effective with Fear the Walking Dead's smaller cast and narrative approach. In May 2018, it was announced that Avi Nash and Callan McAuliffe, who joined the series in the eighth season as the recurring roles of Siddiq and Alden, respectively, were promoted to series regulars. In late May, it was reported that the ninth season would be the final season for Andrew Lincoln, who plays lead character Rick Grimes. Lincoln said that as he lives in England and shooting a season takes six months or more, he believed it was time to leave the series to be able to spend more time with his growing children. However, he has expressed desire to direct an episode in future seasons for the series, and will shadow a director during the ninth season. 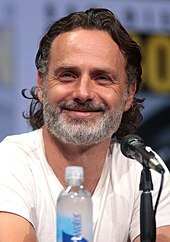 Following the broadcast of Lincoln's last episode, AMC announced their plans to create three films to explore events related to Rick's character in the future, starring Lincoln, and with the first expected to begin production in 2019. Besides Lincoln, Pollyanna McIntosh (Jadis / Anne) will also star in these films. Lauren Cohan also announced that this would be her last season on the series, appearing in the first six episodes as Maggie Greene before her departure. Alongside other acting commitments, Cohan felt she had become too comfortable in the role, and it was time to move on. She appreciated the opportunity to explore Maggie in her last few episodes, and has not ruled out returning for future seasons based on her future commitments. In June 2018, it was reported that Jon Bernthal would reprise his role as Shane Walsh for one episode in the ninth season. In July 2018, it was reported that Lauren Ridloff, a deaf actress, would join the series in the ninth season playing Connie, a deaf survivor who communicates through sign language. Also in July 2018, during San Diego Comic-Con, it was announced that Samantha Morton was cast in the series regular role of Alpha, the leader of the Whisperers, a villain from the comic book series. Several other recurring roles were announced as well, played by Brett Butler, John Finn, Rhys Coiro, Dan Fogler, and Zach McGowan. On October 6, 2018, the day before the season premiere, the showrunners affirmed Bernthal's return as Shane, as well as Sonequa Martin-Green and Scott Wilson returning to reprise their roles as Sasha Williams and Hershel Greene, respectively, at the New York Comic Con. Wilson died later that day due to leukemia; however, according to Comic Book, Wilson had filmed his scenes previously to be broadcast during the first half of the season. The ninth season also features the departures of series regulars Xander Berkeley and Tom Payne, who played Gregory and Paul "Jesus" Rovia, respectively. Berkeley's character is killed off in the first episode of the season, which was adapted from the comic book. Payne's character is killed off in the mid-season finale, which introduces the Whisperers. This was a major departure from the original graphic novel, where Jesus is still alive, and the actor explained, "It's an amazing show and I was so honored to be a part of it, but at the same time, being the same character without anything fun to do is a bit frustrating." Promotional poster for the second half of the season, featuring Samantha Morton as Alpha. Angela Kang stated that the season would include a timeskip, which coincides with the comic's narrative after the "All Out War" arc. She stated that they were aiming to give the series a "fresh look and feel", and "focusing a lot on the core character relationships in the show that have kind of been long-lasting, as well as all of our wonderful series regulars". Kang said that the season would "explore what happened as man made objects and structures break down" and "what happens as resources are getting low", giving the season a Western feel. Actor Tom Payne, who portrays Paul "Jesus" Rovia, said the timejump is about a year and a half from the end of the eighth season, giving enough time for survivors to re-establish farming and livestock raising. A second timeskip occurs towards the end of episode 5, after a helicopter whisks a wounded Rick to safety. The next scene takes place six years later, when a now much older Judith saves a group of survivors from a ring of walkers. This season introduces the Whisperers, a group of human survivors that have created skins and masks out of walkers that allows them to move among and manipulate walker hordes. For these masks, director Greg Nicotero wanted to change the appearance as they are shown in the comic, which gave the masks a type of melting look. Nicotero also did not want to give these masks a look similar to Leatherface's from The Texas Chain Saw Massacre. Instead, they opted to make the Whisperers masks immovable similar to Michael Myers' from the Halloween series, which according to Nicotero, "you cannot judge any kind of emotion". The teaser for the season was released on July 19, 2018, the first day of the 2018 San Diego Comic-Con. The trailer was released on July 20, 2018. The ninth season premiered on October 7, 2018, and the episode was made available a day early via AMC Premiere, the network's on-demand service. The mid-season premiere was made available a week earlier, on February 3, 2019, via AMC Premiere. The series received positive reviews, particularly credited to new showrunner Angela Kang. Critical reception for the ninth season of The Walking Dead has been positive, with critics noting its improvement over the two previous seasons, but remain cautious if the series can maintain its improved quality for the entire season. On Rotten Tomatoes, the season holds a score of 93% with an average rating of 7.03 out of 10, based on 14 reviews. The site's critical consensus reads, "Nine seasons in, The Walking Dead feels more alive than ever, with heightened tension and a refreshed pace that rejuvenates this long-running franchise." On Metacritic, the season has a score of 72 out of 100 based on 4 critics, indicating "generally favorable reviews". Reviewing the season premiere, Sarah Moran of Screen Rant wrote the episode "feels like the fresh start the series so desperately needs, trading grim wartime for a more peaceful period of growth and reflection" and praised the changes made by new showrunner Angela Kang. Erik Kain of Forbes called the first episode "the best episode since season 6 and better than many in that season as well." Brandon Davis of Comicbook.com wrote a highly positive review based on the first three episodes, praising the more character-driven narrative. In another review from Comicbook.com, Cameron Bonomolo also praised the first three episodes of the season, writing, "The Walking Dead is now a political drama viewed through the lens of a zombie apocalypse, turning greater focus to more complex character-driven conflict that is at its strongest since the Frank Darabont-led first season." Bonomolo also called the third episode "jaw-dropping" and that it "delivers some of the finest mystery and drama the show has ever seen in its eight-year run." Jeff Stone of IndieWire wrote a positive review based on the first three episodes and gave them an "A-" grade. He called the ninth season a "huge step up for the show" and that the episodes "are as strong as anything the show's done since the heyday of Season 4." 1 2 3 4 5 6 7 8 Live +7 ratings were not available, so Live +3 ratings have been used instead. ↑ Matthews, Liam (July 5, 2018). "Everything We Know About The Walking Dead Season 9". TV Guide. Retrieved July 13, 2018. 1 2 Goldberg, Lesley (July 20, 2018). "'Walking Dead' Season 9 Trailer Debuts at Comic-Con". The Hollywood Reporter. Retrieved July 20, 2018. ↑ Otterson, Joe (January 13, 2018). "'Walking Dead' Names Angela Kang Showrunner, Scott Gimple Elevated to Chief Content Officer". Variety. Retrieved July 13, 2018. ↑ Ridgely, Charlie (September 5, 2018). "'The Walking Dead' Season 9 Synopsis, Key Art Released". Comic Book. Retrieved September 25, 2018. 1 2 3 Kirsten [@KirstenAcuna] (September 19, 2018). "Just compared season 8 credits with the new ones. Katelyn Nacon AND Tom Payne are the two new additions right before JDM's name at the end. Everyone else is in the same order just w/ Chandler / Lennie James taken out" (Tweet). Retrieved September 21, 2018 – via Twitter. 1 2 3 4 Goldberg, Lesley (May 7, 2018). "'Walking Dead' Promotes Pair to Series Regulars for Season 9 (Exclusive)". The Hollywood Reporter. Retrieved July 13, 2018. 1 2 3 Wigler, Josh (July 20, 2018). "'Walking Dead' Taps Samantha Morton as Iconic Villain". The Hollywood Reporter. Retrieved July 20, 2018. 1 2 3 4 5 6 7 8 9 10 11 Sandwell, Ian; Jeffery, Morgan (July 6, 2018). "The Walking Dead season 9: Release date, cast, new showrunner and everything you need to know". Digital Spy. Retrieved July 13, 2018. ↑ "The Walking Dead Cast & Crew - Michonne". AMC. Retrieved September 16, 2018. ↑ "The Walking Dead Cast & Crew - Eugene Porter". AMC. Retrieved September 16, 2018. ↑ "The Walking Dead Cast & Crew - Aaron". AMC. Retrieved September 16, 2018. 1 2 3 4 5 Bonomolo, Cameron (May 4, 2018). "First Look at 'The Walking Dead' Season 9". Comic Book. Retrieved July 13, 2018. ↑ "The Walking Dead Cast & Crew - Enid". AMC. Retrieved September 16, 2018. ↑ Wigler, Josh (July 21, 2018). "'Walking Dead': How the Season 9 Trailer Sets Up Andrew Lincoln's Exit". The Hollywood Reporter. Retrieved July 22, 2018. ↑ "The Walking Dead Cast & Crew - Gregory". AMC. Retrieved September 16, 2018. 1 2 3 4 5 6 Boucher, Ashley (July 20, 2018). "'The Walking Dead' Casts Nadia Hilker as Magna for Season 9". TheWrap. Retrieved July 20, 2018. ↑ Davis, Brandon (July 16, 2018). "Eleanor Matsuura Cast as Yumiko in 'The Walking Dead' Season 9". Comic Book. Retrieved July 19, 2018. ↑ Davis, Brandon (July 18, 2018). "'The Walking Dead' Adds 'Fantastic Beasts' Star Dan Fogler". Comic Book. Retrieved July 18, 2018. 1 2 Ross, Dalton (July 16, 2018). "The Walking Dead casts Tony nominee Lauren Ridloff for season 9". Entertainment Weekly. Retrieved July 16, 2018. ↑ Goldberg, Lesley (August 24, 2018). "'Walking Dead' Casts Key Comic Book Character for Season 9". The Hollywood Reporter. Retrieved August 24, 2018. ↑ Lawrence, Derek (August 27, 2018). "Sons of Anarchy favorite Ryan Hurst joins The Walking Dead". Entertainment Weekly. Retrieved August 27, 2018. 1 2 Ausiello, Michael (June 18, 2018). "Jon Bernthal Sets Walking Dead Return". TVLine. Retrieved July 13, 2018. 1 2 3 Wigler, Josh (October 6, 2018). "'Walking Dead': Andrew Lincoln Delivers Emotional Goodbye to Fans at New York Comic-Con". The Hollywood Reporter. Retrieved October 6, 2018. 1 2 Davis, Brandon (October 6, 2018). "Scott Wilson Already Filmed 'The Walking Dead' Season 9 Scenes". Comic Book. Retrieved October 6, 2018. 1 2 Barnes, Mike (October 6, 2018). "Scott Wilson, Actor in 'The Walking Dead' and 'In Cold Blood,' Dies at 76". The Hollywood Reporter. Retrieved October 6, 2018. ↑ "Shows A-Z - walking dead, the on amc". The Futon Critic. Retrieved January 28, 2019. 1 2 Welch, Alex (October 9, 2018). "Sunday cable ratings: 'Doctor Who' returns up, 'The Walking Dead' falls to premiere low". TV by the Numbers. Retrieved October 9, 2018. 1 2 Welch, Alex (October 16, 2018). "Sunday cable ratings: 'Doctor Who' dips, 'The Walking Dead' hits series low". TV by the Numbers. Retrieved October 16, 2018. 1 2 Welch, Alex (October 23, 2018). "Sunday cable ratings: 'Shameless' holds steady, 'Walking Dead' slips again". TV by the Numbers. Retrieved October 23, 2018. 1 2 Welch, Alex (October 30, 2018). "Sunday cable ratings: 'Doctor Who' holds steady, 'Walking Dead' ticks back up". TV by the Numbers. Retrieved October 30, 2018. 1 2 Welch, Alex (November 6, 2018). "Sunday cable ratings: 'The Walking Dead' ticks up again, 'Outlander' premieres down". TV by the Numbers. Retrieved November 6, 2018. 1 2 Welch, Alex (November 13, 2018). "Sunday cable ratings: 'Outlander' dips, 'Doctor Who' holds steady". TV by the Numbers. Retrieved November 13, 2018. 1 2 Welch, Alex (November 20, 2018). "Sunday cable ratings: 'Doctor Who' ticks back up, 'The Walking Dead' slips again". TV by the Numbers. Retrieved November 20, 2018. 1 2 Welch, Alex (November 28, 2018). "Sunday cable ratings: 'The Walking Dead' midseason finale improves, 'Outlander' inches up". TV by the Numbers. Retrieved November 28, 2018. 1 2 Welch, Alex (February 12, 2019). "Sunday cable ratings: 'The Walking Dead' returns steady, 'True Detective' rebounds". TV by the Numbers. Retrieved February 12, 2019. 1 2 Welch, Alex (February 20, 2019). "Sunday cable ratings: NBA All-Star game leads, 'The Walking Dead' takes a hit". TV by the Numbers. Retrieved February 20, 2019. 1 2 Welch, Alex (February 26, 2019). "Sunday cable ratings: 'True Detective' finale rises, 'Shameless' ticks down". TV by the Numbers. Retrieved February 26, 2019. ↑ "The Walking Dead: Guardians". Gracenote. Retrieved February 5, 2019. ↑ "The Walking Dead: Chokepoint". Gracenote. Retrieved February 5, 2019. ↑ "The Walking Dead: Scars". Gracenote. Retrieved February 8, 2019. ↑ "The Walking Dead: The Calm Before". Gracenote. Retrieved February 8, 2019. ↑ "The Walking Dead: The Storm". Gracenote. Retrieved February 8, 2019. ↑ Schwartz, Ryan (January 13, 2018). "Walking Dead Renewed for Season 9, New Showrunner Named". TVLine. Retrieved July 13, 2018. ↑ Prudom, Laura (January 13, 2018). "The Walking Dead Renewed for Season 9, Angela Kang Promoted to Showrunner". IGN. Retrieved January 13, 2018. ↑ Sandwell, Ian (May 1, 2018). "The Walking Dead season 9 reveals filming has begun". Digital Spy. Retrieved July 13, 2018. ↑ Davis, Brandon (July 14, 2018). "Michael Cudlitz Returning to 'The Walking Dead' as Director". Comic Book. Retrieved July 16, 2018. ↑ Wigler, Josh (October 3, 2018). "'Walking Dead' Launches New Opening Credits Sequence for Season 9 (Video)". The Hollywood Reporter. Retrieved October 3, 2018. ↑ Wigler, Josh; Goldberg, Lesley (February 25, 2018). "'Walking Dead': Is Rick Going to Die?". The Hollywood Reporter. Retrieved March 12, 2018. ↑ Goldberg, Leslie (March 10, 2018). "'Walking Dead' Star to AMC on Lauren Cohan Salary Standoff: "Pay the Woman"". The Hollywood Reporter. Retrieved March 12, 2018. ↑ Ross, Dalton (April 25, 2018). "The Walking Dead's Lauren Cohan to return for season 9". Entertainment Weekly. Retrieved April 25, 2018. ↑ O'Donnell, Sean (August 19, 2018). "Lennie James Reveals Why Morgan Moved To Fear The Walking Dead". Screen Rant. Retrieved September 10, 2018. ↑ Trumbore, Dave (May 29, 2018). "Exclusive: Andrew Lincoln to Exit AMC's 'The Walking Dead' in Season 9". Collider. Retrieved May 29, 2018. ↑ Ross, Dalton (July 30, 2018). "Andrew Lincoln reveals why he is leaving The Walking Dead". Entertainment Weekly. Retrieved July 30, 2018. ↑ Ross, Dalton (September 25, 2018). "Andrew Lincoln could be returning to The Walking Dead — to direct". Entertainment Weekly. Retrieved September 25, 2018. ↑ Otterson, Joe (November 5, 2018). "Andrew Lincoln to Star in Multiple 'Walking Dead' Movies for AMC". Variety. Retrieved November 5, 2018. ↑ Rancilio, Alicia (August 20, 2018). "Beyond 'The Walking Dead,' Lauren Cohan is ready for change". Associated Press. Retrieved August 20, 2018. ↑ Ross, Dalton (November 1, 2018). "Lauren Cohan opens up about leaving The Walking Dead — and her possible return". Entertainment Weekly. Retrieved November 1, 2018. ↑ "'Walking Dead': Andrew Lincoln Delivers Emotional Goodbye to Fans at New York Comic-Con". The Hollywood Reporter. Retrieved October 7, 2018. ↑ Wigler, Josh (October 7, 2018). "Walking Dead' Star Breaks Down That Harrowing Death Scene". The Hollywood Reporter. Retrieved October 8, 2018. ↑ Wigler, Josh (November 26, 2018). "'Walking Dead' Star Gets Candid About His Exit: "It Was Constant Frustration"". The Hollywood Reporter. Retrieved November 26, 2018. ↑ Goldberg, Lesley; Real, Evan (June 20, 2018). "New 'Walking Dead' Showrunner Confirms Season 9 Time Jump". The Hollywood Reporter. Retrieved June 21, 2018. ↑ Ross, Dalton (July 11, 2018). "First image and intel on The Walking Dead season 9 time jump". Entertainment Weekly. Retrieved July 13, 2018. ↑ Gilyadov, Alex (August 6, 2018). "The Walking Dead: Season 9 Time Jump Length Revealed". IGN. Retrieved August 6, 2018. ↑ Ross, Dalton (November 4, 2018). "The Walking Dead showrunner on that time jump shocker and Rick's goodbye". Entertainment Weekly. Retrieved November 5, 2018. ↑ Mathews, Liam (January 24, 2019). "How Michael Myers Inspired The Walking Dead's Horrifying Whisperer Masks". TV Guide. Retrieved January 26, 2019. ↑ Perry, Spencer (July 19, 2018). "Comic-Con: The Walking Dead Season 9 Trailer Teaser Debuts". ComingSoon.net. Retrieved July 20, 2018. ↑ Powell, Austin (October 6, 2018). "Is AMC Premiere worth it?". The Daily Dot. Retrieved October 6, 2018. ↑ Patten, Dominic (January 31, 2019). "'Walking Dead' Midseason Debut Drops Super Bowl Sunday On AMC Premiere". Deadline. Retrieved January 31, 2019. 1 2 "The Walking Dead: Season 9". Rotten Tomatoes. Retrieved October 7, 2018. ↑ "The Walking Dead: Season 9". Metacritic. Retrieved October 1, 2018. ↑ Morgan, Sarah (September 20, 2018). "The Walking Dead Season 9 Premiere Review: A New Era Begins Now". Screen Rant. Retrieved September 25, 2018. ↑ Kain, Erik (September 20, 2018). "'The Walking Dead' Season 9 (Spoiler-Free) Review: Is This A Comeback?". Forbes. Retrieved September 25, 2018. ↑ Davis, Brandon (September 20, 2018). "'The Walking Dead' Season 9 Review: The Old Show's Return". Comic Book. Retrieved September 25, 2018. ↑ Bonomolo, Cameron (September 20, 2018). "Review: A New Beginning Makes 'The Walking Dead' Season 9 the Best in Years". Comic Book. Retrieved September 25, 2018. ↑ Stone, Jeff (October 1, 2018). "'The Walking Dead' Review: Season 9 Is a Huge Step Up For the Show". IndieWire. Retrieved October 1, 2018. ↑ Welch, Alex (October 18, 2018). "'The Walking Dead' and 'American Horror Story' lead the cable Live +7 ratings for Oct. 1-7". TV by the Numbers. Retrieved October 18, 2018. ↑ Welch, Alex (October 29, 2018). "'American Horror Story' and 'Mayans M.C.' land high in the cable Live +7 ratings for Oct. 8-14". TV by the Numbers. Retrieved October 29, 2018. ↑ Welch, Alex (October 29, 2018). "'American Horror Story' and 'Walking Dead' remain on top of the cable Live +3 ratings for Oct. 15-21". TV by the Numbers. Retrieved October 29, 2018. ↑ Pucci, Douglas (November 2, 2018). "Live+3 Weekly Ratings: 'Ray Donovan' Season Premiere Leads Premium Cable Telecasts". Programming Insider. Retrieved November 2, 2018. ↑ Pucci, Douglas (November 10, 2018). "Live+3 Weekly Ratings: Andrew Lincoln's Exit from 'The Walking Dead' was Week's Second-Largest Raw Gainer Among Adults 18-49". Programming Insider. Retrieved November 10, 2018. ↑ Pucci, Douglas (November 16, 2018). "Live+3 Weekly Ratings: 'It's Always Sunny in Philadelphia' 13th Season Finale on FXX Nearly Triples its Adults 18-49 Audience". Programming Insider. Retrieved November 16, 2018. ↑ Pucci, Douglas (November 26, 2018). "Live+3 Weekly Ratings: 'American Horror Story: Apocalypse' Season Finale Tops Cable Telecasts in Raw Adults 18-49 Gains". Programming Insider. Retrieved November 26, 2018. ↑ Pucci, Douglas (November 30, 2018). "Live+3 Weekly Ratings: 'The Walking Dead' Fall Finale Tops All Telecasts in Raw Adults 18-49 Lifts". Programming Insider. Retrieved November 30, 2018. ↑ Pucci, Douglas (February 15, 2019). "Live+3 Weekly Ratings: 'The Walking Dead' Winter Premiere the Dominant Cable Leader (and Seventh-Ranked Among TV Overall) in Adults 18-49 Raw Gains". Programming Insider. Retrieved February 15, 2019. ↑ Pucci, Douglas (February 22, 2019). "Live+3 Weekly Ratings: 'Project Blue Book' the Runner-Up Scripted Cable Telecast in Raw Viewer Gains". Programming Insider. Retrieved February 22, 2019.